HP unveils a new multimedia version of its Pavilion x360 with the 14-ba107nf. This 14-inch tablet-sized ultrabook is equipped with a robust Kaby Lake Refresh i7 Quad Core, 8GB of RAM and 1.1TB hybrid storage, and the GeForce 940MX dedicated to graphics management. . Its sleek silver frame is dominated by a beautiful Full HD IPS rotary touch screen with edge-to-edge design. Guaranteed immersion. And then there is the backlit keyboard, USB Type-C connection and satisfactory autonomy for the pleasure part. The HP Pavilion x360 14-ba030nf sports a sober and elegant design with its smooth, matte, silver-gray (gray) aluminum silver lid. The interior contrasts slightly with a lighter silver keyboard turn and a discreet vertical brushed pattern. 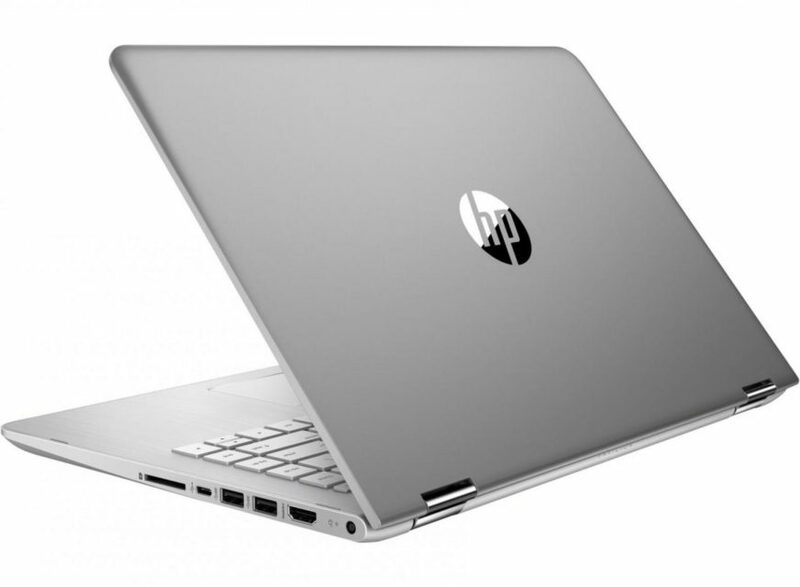 A touch of extra elegance is provided by the chrome HP logo that echoes the glossy hinges. Note also that the keyboard inherits a white backlight system , a plus for typing in dark mood. For a 14 inches, its measurements are not especially compact with a thickness of 19.9 mm and a weight of 1.7 kg , which can weigh at arm\’s length when using tablet mode. Because the characteristic of this convertible ultrabook lies in its nomadic propensity characterized by its 360-degree rotating configuration . The hinges of the screen allow it to bend from all angles. With a simple gesture, you can switch from a classic desktop use to a tablet (flip screen on the back of the keyboard) through the tent or the easel mode. Welcome to exploit this ultrabook away from a socket, autonomy exceeds 7 hours in Web browsing with active Wifi, it is in the right average. 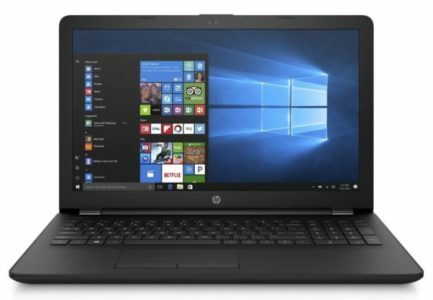 The HP Pavilion x360 14-ba107nf is based on a processor of last generation Quad i7 Kaby Lake Refresh , a guarantee of performance. Indeed, this CPU surpasses by nearly 50% its predecessor i7-7500U in terms of power. Perfectly comfortable with office and multimedia tasks, including surfing the Internet, playing videos, working on Office or photo editing (Photoshop, Lightroom), he can also tackle other missions a little more demanding thanks to a good exploitation of the Turbo (Adobe Première, editing). In addition, the 8 GB of RAM provide a fluid multitasking environment, even if you multiply active applications and / or tabs on the web. Opposite, the graphic part is for very casual players. This is a dedicated middle / entry-level solution, the GeForce 940MX . In condition, it does not play properly in Full HD, if not very undemanding titles. On the other hand, it will be able to launch the majority of the games of the market in standard definition (1366 x 768 pixels), with adaptations on the level of details under the demanding opuses. Storage relies on a hybrid solution that puts the emphasis on responsiveness without sacrificing space. In principle, the 128 GB of the SSD will contain the operating system and a part of the programs / games while the hard disk of 1000 GB takes care of the storage of your toy library, thus ensuring an efficient overall execution, phases of development. instant on / off and fast data copies. Lovers of beautiful images will be able to appreciate the faithful colors and the clear and homogeneous display ensured by the IPS panel . Especially since the Full HD screen (1920 x 1080 px) has a large display density to enjoy the best of your content in High Definition and modulate the display without losing sharpness. On the other hand, the brilliant treatment may slow down some. If it is considered overall more aesthetic than a matte slab, it causes indeed many reflections in bright environment. The connector has a USB Type-C (Gen1) port added to two standard USB 3.1 ports. An HDMI output and an SD card reader are also planned, as well as the latest generation of WiFi AC and Bluetooth 4.2 modules for faster wireless data exchange. No fingerprint reader on the other hand.